The Welsh government said it is "extremely disappointing" that a deal has not been struck to take over a Monmouthshire renewable energy factory and its workforce. 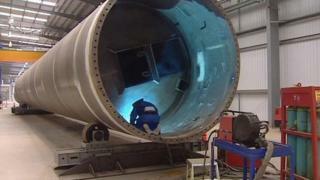 Mabey Bridge's (MB) £38m turbine tower-building plant in Chepstow has closed after four years. Simec - new owners of Uskmouth power station - said it was prepared to buy the plant and take on the 120 workers. But MB said it failed to find a viable buyer despite "exhaustive efforts". The company, whose main factory is in nearby Lydney, Gloucestershire, said no viable solution had been found despite an "extensive search and marketing process". The Welsh government has now expressed its disappointment after it had worked closely with the company to secure new owners. "We have actively supported two separate bids for the business, both of which would have safeguarded employment at the site and provided a secure future for the business," said a spokesperson. "But we were very disappointed that neither of these bids were acceptable to Mabey Bridge." MB announced last December it was looking to sell its renewable energy division but in July said those efforts had been unsuccessful and it would have to close. In a further statement on Wednesday, chairman Juliette Stacey, said: "We have explored every avenue available to us in a bid to keep the site open, but sadly it has not been possible to do so." The final shift for the 120 workers ended at lunchtime on Wednesday. Four years ago MB was expanding on a grand scale, building steel towers rather than iron bridges - which the family firm was known for since it was founded 160 years ago. The company will now concentrate on its bridge building business. One of those interested in buying the renewable division was Hong Kong-owned Simec, which struck a deal to take over the Uskmouth power station last December. The coal-burning plant has been been back in operation since June. Simec is part of a wider group of companies headed by Liberty which bought the former Alphasteel - more recently known as Mir - steelworks in Newport. It wanted to buy the MB site and re-employ the staff whose jobs are under threat. MB had already listed engineering equipment and other assets on a website to attract buyers. Simec was interested and it was looking beyond coal-burning to biomass, oil and renewables to generate energy. BBC Wales understood an offer of about £8.5m had been made to MB but it had valued the land and buildings at £11.5m. Simec chief executive James Busche admitted his company had entered negotiations late but said it still hoped to strike a deal - if not in time for the last shift. He said: "The Mabey facility in Chepstow has some very talented people, very fit-for-purpose equipment and there's the building itself. "Our interest is to continue with some of what they've been doing - the wind towers - but there are lots of other possibilities as well, some relating to UK and Welsh projects like the tidal lagoon and new high voltage transmission towers that National Grid and other European countries are putting in right now. "There are lots of opportunities which fit the skill of the people." The company made a direct appeal to MB not to close the factory and believed it was a "sustainable, profitable business". MB said despite continued efforts to improve productivity it faced "an exceptionally competitive international market for renewables"
Ms Stacey added: "This is a difficult day for Mabey Bridge but we will now focus on building a stronger and more sustainable future for the business". The Welsh government said it stood ready to provide support if new offers emerged.